And the start of an all new Power Ranger series has begun! Here are the clips from the first episode of Power Rangers Ninja Steel along with the first opening of the series courtesy of Neo Saban Power Rangers! 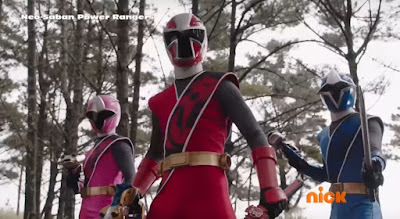 So what was your impression for the first episode of Power Rangers Ninja Steel? Post e'm down the comments section below! This blue reminds me of Dax. His brother set the bar high, I hope we can see him follow that. Woah, woah, woah... I just saw Starninger spoiled (for those who haven't already kept up with Ninninger), Mini Shinobimaru acting like Alpha, Boom from SPD, a Quester from Boukenger (forgot American name), and Hiramechimedes/Venjix all in one episode's worth of clips. I don't know quite 100% how I feel, but I think I like it. I also appreciate how every season we move a little further from recycling the same theme song. Still don't know what was wrong with the Ninja Ichibantou though that they couldn't use it as the morpher. Oh well. Is it me or is there just something about the suits that really make it obvious it's the PR suits and not the Sentai ones? I think it might be that the Sentai suits have more of a sheen to them while the PR ones are more matte. Well3, finally Saban learned from their mistakes (Samurai,Super Megafail). Might give this ninja kiddos a chance after Dino Hope's season. That's how it has always been, right? You can always tell the difference between the scenes taken from Japanese version and ones that are filmed exclusively for PR. For example, in Dino Charge, the Gold Ranger stood out the most with its shiny/non-shiny suit. I'm guessing it's because of the camera? Or the Japanese just used shiny and better fabric in their costumes. As for Ninja Steel, I'm a bit iffy that they've decided to go back to high school again, after Dino Charge proved that making the members as more mature/adult worked really good. But I guess I'll give this show a chance for a few episodes first. I mean, it can't be worse than Ninninger itself, right? Oh and yeah... liking how the theme song feels different too. At least, until it changes back into the been there done that vibe in the second half. LOL.